Considering 77% of consumers think national chains offer more competitive pricing, it is essential to set your small business apart by delivering quality and customer service. Providing customers with a personalized experience enables your business to be chosen over name brand stores. 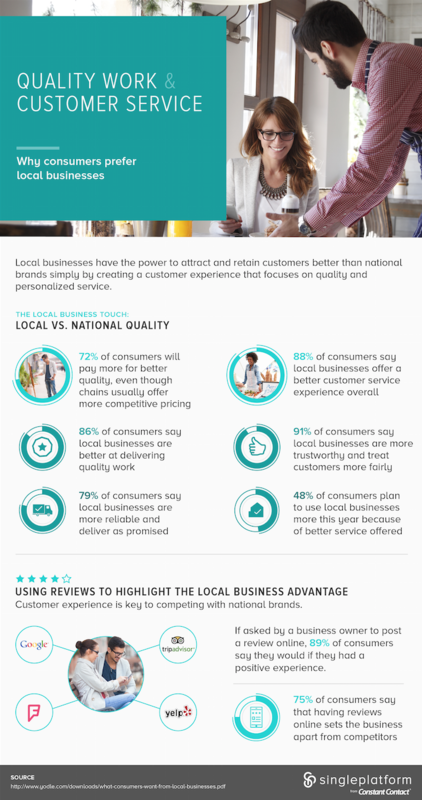 When it comes to national chains and local businesses, 72% of consumers are willing to pay your small business more for a higher quality product, even though 77% of consumers say national chains offer more competitive prices. When it comes to purchasing a product or service, price isn’t necessarily a factor – but quality is. Ensuring that your business offers a high-quality product that satisfies customers’ needs in both the short and long-term will ensure they choose you over national chains. Creating a positive experience by providing stellar customer service not only engages your customers with your brand, but also creates loyal customers; 88% of consumers say local businesses offer better, more personalized service, in comparison with national chains. While national chains may offer lower prices, customers will opt to purchase from you if they know they’ll have a positive customer service experience. If asked by a business owner to post a review online, 89% of customers say they would if their experience was positive. By promoting your business online and encouraging customers to post about their positive experiences with your business, you not only create brand ambassadors (and loyal customers), but also provide testimonials to potential customers that your business consistently delivers personalized service and satisfaction. Understanding the customer advantages of using a local business, and capitalizing on them, ensures your business will be chosen (consistently) over your biggest competitors: national chains.